Switching to Vodien Internet Solutions involves the process of transferring your website from your current hosting service to us. This means that all your website files will be migrated over to our hosting servers and can be accessed using our hosting manager, once the switch is successful. Important: DO NOT CANCEL – nor inform your current Web Hosting service of your plan to transfer – before the whole website Migration process is over. Click the Buy Now button on the Web Hosting plan you prefer. Under Select Plan, choose a plan period then, tick the boxes corresponding to the Addons you’d like to use along with your hosting plan. Select I own this domain name if you want to connect the hosting to a registered domain that you own. 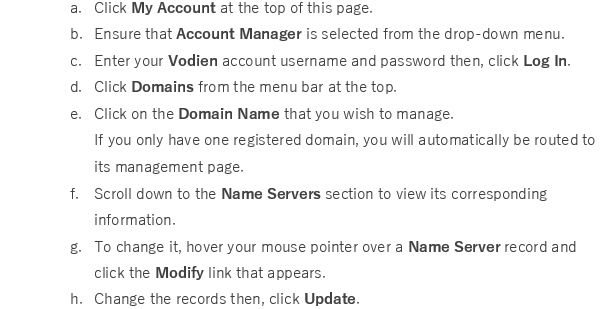 Otherwise, select Register a new domain to connect it to a new one. Enter the Domain Name in the field provided, then click Continue Order. 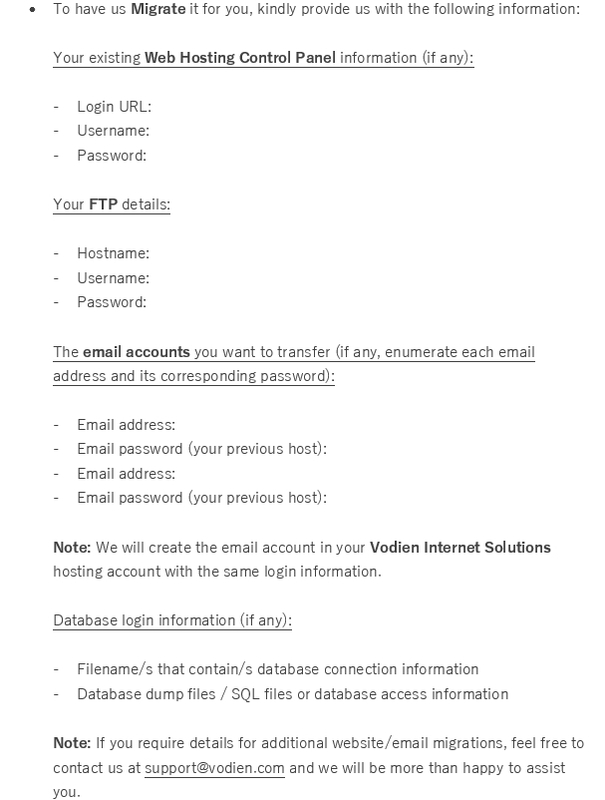 Complete the required information under New Customer if you don’t have a Vodien account. Or, enter your username and password and Log In if you have one. Continue to pay for and activate the hosting plan. Once successful, you will receive a confirmation email. Contact us so we can perform the website Migration for you, or you can refer to the details below to do it yourself. Ensure that you have a full backup of your Web Hosting account before you get ready to move. Download all your website and email files and write down any extra information you’ll need – such as your email account settings, MySQL authentication details, passwords, and so on. Tip: Most hosting services have built-in backup systems. You may contact your current hosting provider for help on how to back up your website account. If you are transferring your Domain Name to us from another registrar, we will take care of this step for you. It takes up to 48 hours for a Domain Name to propagate worldwide. For any further assistance, feel free to contact us and we will be happy to update your Name Servers for you. After approximately 48 hours, your website will be accessible online at its new location. Simply enter the Domain Name in any browser to check your website live. And, after ensuring you’ve backed up everything and you’re positive you won’t need to review any more settings from your old hosting account, you can now terminate your previous Web Hosting service.